The Indian Women’s national team will be aiming to qualify for the second round of the 2020 AFC Women’s Olympic Qualifying Tournament for the first time in its history as it gets set to take on Nepal on Thursday (November 8) in their opening encounter in Group C.
After arriving in the Burmese capital of Yangon earlier, the team held its first training session at the Thuwunna Stadium on Wednesday (November 7) and at the pre-tournament press conference, coach Maymol Rocky made her side’s intentions very clear. “We have come prepared for the tournament. We know that it’s a qualifying round for the next Olympic Games and from our side, we are ready and here to qualify for the next stage,” she declared. Team India will take on Nepal in their first match, who are playing the Olympic qualifiers for the first time in their history. “It is our first opportunity of playing at this level and we would like to thank the AFC for this chance. We will try our best to give a good account of ourselves and will learn many important things from this tournament,” said Nepal head coach Hari Khadka. With hosts Myanmar the highest-ranked team in the group according to the FIFA Rankings, the clash between India and Bangladesh will be a critical one in context of which teams make it to the next round. 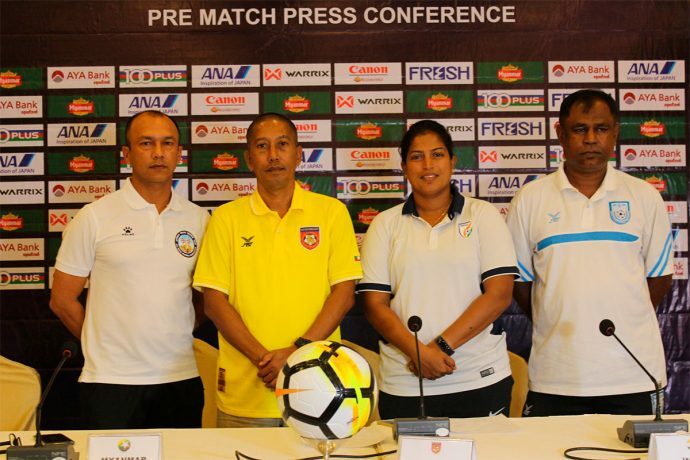 Bangladesh coach Golam Robbani Choton also talked about his side’s chances and said that his team will look to compete hard. “We are ready for the challenge. The girls have been training together for the last one year and we hope to provide a tough challenge in every match, and make it to the next round,” he said.